Natural solutions to eliminate pain and promote physical health and longevity. In 2015, the American Journal of Rhinology and Allergy published research that found acupuncture is effective for the treatment of allergic rhinitis. Allergic rhinitis is also known as hay fever. The researchers compiled the results from 13 quality studies, which followed 2,365 participants. The various studies confirmed that acupuncture significantly lowers the antibody known as immunoglobulin E or IgE. IgE is the antibody associated with allergies and hypersensitivities. The researchers found not only was the IgE antibody lowered, but so too were the symptoms associated with allergic rhinitis. Additionally, the participants reported better quality of life. Acupuncture and Traditional Chinese Medicine (TCM) can offer a solution to seasonal allergies that is all natural and will save you money. TCM uses an elemental system to determine where there are excesses and deficiencies in each person, allowing the treatments to be completely customized to each patient. The unique treatment plans not only make them more effective than one-size-fits-all, over-the-counter medications, they also address imbalances in each person that would not necessarily be connected to an aggravation of allergies in Western medical thought. When using TCM to treat allergies, practitioners focus heavily on something called Wei Qi. Wei Qi is similar to the immune system in Western medicine. Wei Qi protects the body against foreign materials that can lead to inflammation and eventually allergies. People with lower immunity or Wei Qi are more susceptible to allergies and frequent colds. Acupuncture helps to boost the Wei Qi making it more difficult for allergens to attack the body. A comprehensive plan that includes acupuncture treatments, herbs, and dietary changes will yield the best results when it comes to fighting allergies. 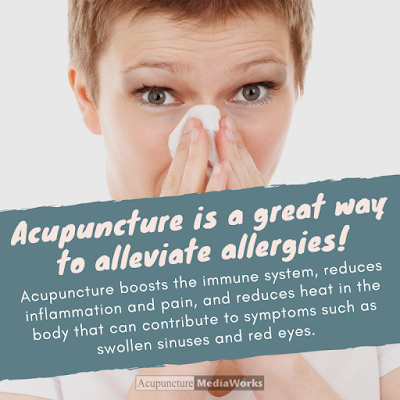 Be sure to seek out a professional, fully trained and properly licensed acupuncturist and you will be grateful year after year for the relief they provide when it comes to treating allergies.